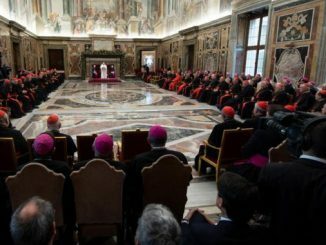 We have heard the Pope say over and over again that he is no theologian and that he doesn’t care much for theology, but it is exactly that attitude which has caused so much damage in this pontificate. A renowned Italian rabbi, Giuseppe Laras, recently wrote an open letter in response to developments within the Italian Biblical Association which he considers extremely problematic in terms of Jewish-Christian relations. In fact, he says that he is “very indignant and embittered.” Most interestingly, he asserts that Pope Francis has aided and abetted this development. We haven’t heard of a Jewish leader accusing a Pope of “anti-Judaism” in decades. What can account for this? 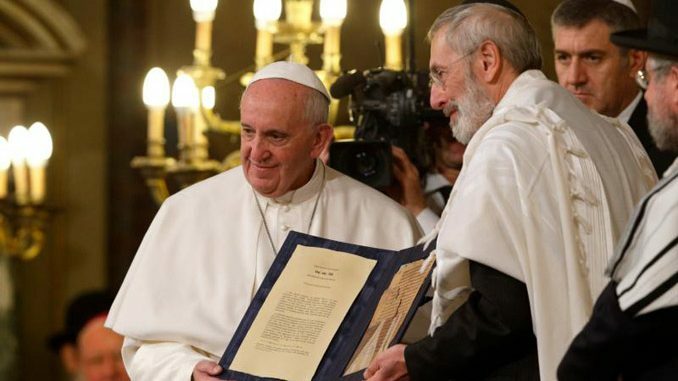 Isn’t Pope Francis an intimate friend of an Argentinian rabbi? Don’t most Jews appreciate his open attitude toward them? Rabbi Laras complains of a strong undercurrent of “anti-Judaism,” which is not synonymous with anti-Semitism. The latter is racial prejudice, while the former is theological prejudice. The rabbi argues that he sees a resurgence “of resentment, intolerance, and annoyance on the Christian side toward Judaism; a substantial distrust of the Bible and a subsequent minimization of the Jewish biblical roots of Christianity.” Further, he sees “the resumption of the old polarization between the morality and theology of the Hebrew Bible and of Pharisaism, and Jesus of Nazareth and the Gospels.” He identifies this trend with the second-century heretic Marcion, who disdained Judaism and even claimed a total disconnect between the God of the Old Testament and the God of Jesus Christ. Laras admits that official Catholic teaching repudiates such positions but then laments: “What a shame that [those official positions] should be contradicted on a daily basis by the homilies of the pontiff, who employs precisely the old, inveterate structure and its expressions, dissolving the contents of the aforementioned documents.” Is this an example of Jewish hyper-sensitivity? Unfortunately not. As a young seminarian, I became (ironically) the first graduate of the Jewish Academy Without Walls! During my years of service with the Catholic League for Religious and Civil Rights, I worked closely with the three major Jewish organizations in New York: B’nai B’rith, American Jewish Committee, and the American Jewish Congress. 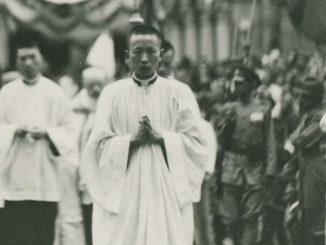 Our relations were not always placid, but they were always respectful. A life-long friendship was formed with Rabbi Leon Klenicki of B’nai B’rith – although the relationship began as an intense conflict over Jewish opposition to legislation aiding parochial school children. Rabbi Klenicki and I co-authored books and articles and appeared together at various workshops on Church-State relations. He had a profound respect and even affection for Popes John Paul II and Benedict XVI. He prided himself on his Argentinian background and was thrilled when, shortly before his death, Pope Benedict named him a Knight of St. Gregory. The rabbi had far-reaching antennae to detect anti-Judaism; association with him developed that capacity in me as well. As a result, I cringed when Pope Francis, in his first homily to the cardinals after his election, declared that anyone who does not pray to Christ prays to the Devil! On other occasions, he has replaced “Devil” with “idols”. When has that ever been held in the history of the Church? Indeed, we Christians do not always pray directly to Christ. We may pray to God the Father or to God the Holy Spirit. We Catholics likewise pray to Our Lady and the other saints. The Pope himself very often urges people to join him in praying the “Hail Mary.” So, whence arises the disconnect between papal talk and papal action? It stems from the Pope’s carelessness in speech, for starters. He is possessed of so negative an attitude toward theology that he fails to frame his comments with the requisite precision. Rabbi Laras’ critique of dichotomous papal presentations of morality is similarly valid. Francis consistently pits “the Law” against “the Gospel” – not unlike Martin Luther (an inveterate anti-Semite). Even St. Paul acknowledges that “the Law” is good and holy. Francis’ allergic reactions to law make him see stark differences where complementarity is more in order. In point of fact, Our Lord’s Sermon on the Mount is one, non-stop exposition of law – a law even more demanding than that of the Judaism of his day. 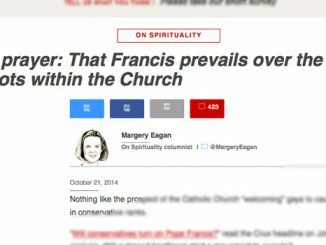 Truth be told, Francis rails against law because of his predisposition against canon law and canon lawyers – as well as moral theologians who represent the consistent trajectory of Catholic morality. Last but not least, Rabbi Laras took offense at Francis’ constant attacks on the Pharisees. As we know from four years of experience now, this is a genuine papal “trigger”, which he uses against anyone who seems to hold the line on absolutes. However, the Pope appears to be quite ignorant of the Pharisaic movement in the time of Christ, which was a lay reform movement established in reaction to the corrupt Temple priesthood, desirous of worldly approval in preference to following God’s will and law. Without the Pharisees, it is no exaggeration to say that Judaism would have died by assimilation to the pagan culture. Most importantly, the major positions of the Pharisees – resurrection of the body, the existence of angels, the importance of fasting and almsgiving – were all positions of Jesus himself. If that is so, why were the Pharisees a frequent target of the Lord’s condemnations? 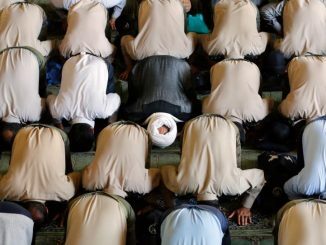 For one simple reason: He accepted their theology but rejected their approach. One doesn’t find Jesus in conflict with the Sadducees, whose theology was polar opposite of the Pharisees; he didn’t “waste” his time with them because they were just patently wrong. He confronts the Pharisees because their theology is on-target, and they are worth the effort to correct. It is significant that one of Jesus’ denunciations of the group warns his disciples, “Unless your holiness (righteousness) surpasses that of the Scribes and Pharisees, you will not enter the Kingdom of God” (Mt 5:20). In other words, there was genuine holiness and righteousness among the Pharisees, but Our Lord’s followers needed to do and be better. We have heard the Pope say over and over again that he is no theologian and that he doesn’t care much for theology, but it is exactly that attitude which has caused so much damage in this pontificate. On the Jewish front, someone needs to offer him a tutorial in works like that of Jules Isaac, the Jewish author of Jesus and Israel, and The Jewish People and Their Scriptures in the Christian Bible, produced by the Pontifical Biblical Commission under the headship of Joseph Cardinal Ratzinger. Francis’ uninformed and tendentious statements risk setting Catholic-Jewish relations back decades, if not centuries. To be sure, being faithful to a Catholic understanding of the Christ-event will never be fully acceptable to Jews (otherwise, they would be Christians!). Catholics, for instance, can never accept the “dual covenant” theory (sadly promoted by a committee of the United States Catholic Conference some years ago but eventually retracted, presumably at the urging of the Congregation for the Doctrine of the Faith), which holds that there is a covenant of salvation for Gentiles, while the former covenant is still valid for Jews. Unnecessary and reckless provocations, however, ought to be avoided. Which is why this Pope should be prevailed upon to vet his comments with theological experts, even if he doesn’t really think very highly of them. That procedure would also save him (and the Church) a lot of problems within the Catholic family as well. My friend, Rabbi Klenicki, would have been proud that a fellow-countryman had been elected Pope. Having a sizeable quantity of chutzpah, however, he would have demanded an audience with Francis to “re-educate” him.